A severe, localised stem rust epidemic has broken out in southern Ethiopia during November-December 2013. The districts of Agarfa and Gasera in Bale zone are the most seriously affected, but some spread into other areas is now being reported. The previously resistant and popular cultivar “Digelu” is showing extreme susceptibility, with unsprayed crops exhibiting 100% incidence and 100% severity. Fields with, or close too, 100% loss have been observed (Fig. 1). It is estimated that approximately 10,000 ha of wheat in and around Agarfa and Gasera have been effected. Some effective control has been achieved by farmers who sprayed with registered and well tested fungicides. Research and government agencies in Ethiopia are very actively responding to the current situation. Extensive sampling of stem rust has been undertaken in the affected areas; samples are currently undergoing analysis at EIAR’s Ambo Plant Protection Center, the Global Rust Reference Center, Denmark and the USDA-ARS Cereals Disease Lab, Minnesota. At the current moment in time no definitive information is available on the identity of the race(s) involved in the epidemic. Within the next few weeks confirmation of the causal race(s) should be determined. 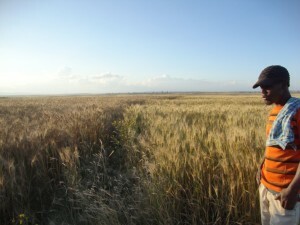 Wheat production in the affected area of Ethiopia is somewhat asynchronous with the rest of the country, so the majority of farmers in the surrounding wheat growing areas have already safely harvested the crop. However, some relatively small pocket areas do exist where wheat is still at a susceptible stage. These pocket areas are at risk and new reports of stem rust outbreaks are being received. All relevant institutions in Ethiopia are aware of the situation and control efforts are being targeted towards these new outbreak areas. The Arsi Robe district just to the north of the initial core epidemic area is now reporting high levels of stem rust, and stem rust outbreaks have occurred on a commercial farm (400 ha) in Guji zone, approximately 200km to the southwest of Agarfa and Gasera. Some geographic expansion within Ethiopia and continued spore production for several more weeks is therefore the most likely scenario. To determine the potential risk in the surrounding region, comprehensive modelling of viable spore deposition from the Bale epidemic has been undertaken by the epidemiological modelling group at Cambridge University, UK led by Prof. Chris Gilligan. 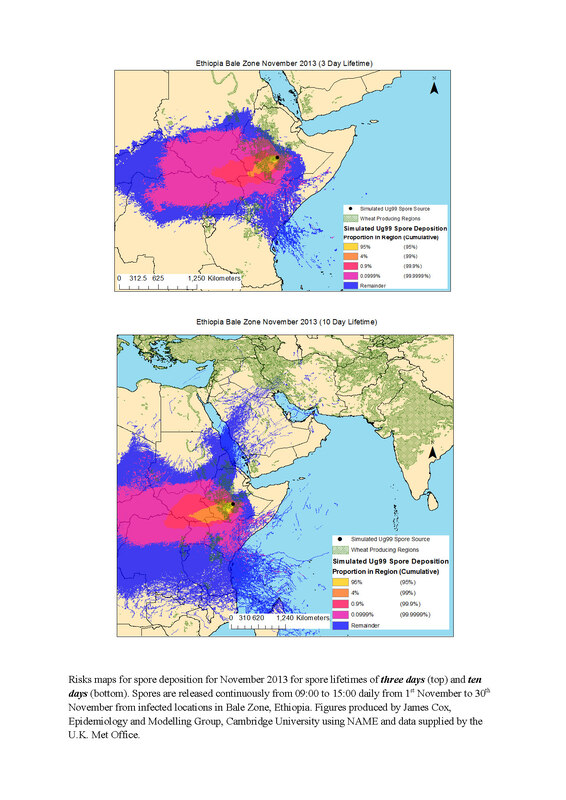 Initial results indicate that for spores released during November 2013, with an assumed 3 day spore lifetime, spore deposition has occurred predominantly to the South and South-West of the infected source locations in Ethiopia (Fig. 2 Top). 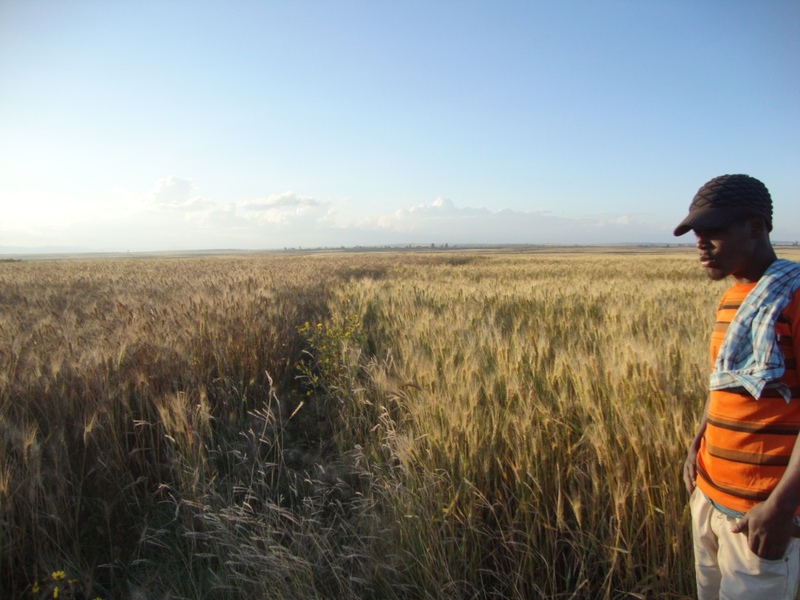 Thus the majority of wheat growing regions in Ethiopia are at risk (fortunately most of these should be wheat-free at the current time), along with wheat areas to the south (Kenya, Uganda, Rwanda, and Tanzania); but areas to the North and East are not at risk. With an assumed 10 day spore lifetime, risk extends significantly into the Middle East (Fig. 2 Bottom). Thus, if wheat is present at a suitable growth stage and environmental conditions are suitable then these areas may be at risk if spores can remain viable for ten days. It should be noted that the dark blue areas on the spore deposition maps indicate very low risk, but they are not entirely risk free. Based on current status and available information, close monitoring and contingency planning for possible outbreaks should be undertaken on any potentially receptive wheat crops in the following countries / regions: East Africa (Burundi, Ethiopia, Eritrea, Kenya, Rwanda, Sudan, Tanzania, Uganda); Middle East (Yemen, Saudi Arabia, southern Iraq, southern / western Iran). This is an on-going situation and every attempt will be made to provide reliable, updated information on a regular basis.